Blue Ocean Shift was written by W. Chan Kim and Renee Mauborgne. They also authored Blue Ocean Strategy. They encourage businesses and organizations to challenge the status quo and adopt a market-creating strategy. They define a red ocean as a market that has a lot of competition and pricing pressures. This type of market has been “commoditized”. They define a blue ocean where innovations in products, services and processes brings value and creates new and less competitive markets. 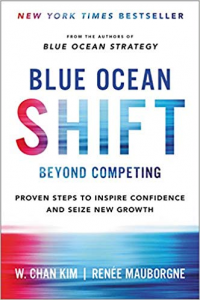 The authors describe a process from moving from a red ocean to a blue ocean. The steps include creating a team, understanding where you are, imagining where you could be, defining how to get there and making your move. The design of the process seems to have very large businesses, organizations and even countries in mind. However, there are nuggets for the small business owner. If your business is in decline or you would simply like to grow even more, take actions to make it happen. Challenge the status quo in regards to your products, services, processes and marketing strategy. The authors write “the fact is, successful market-creating strategies often don’t rely on technology innovation at all”. This information could be helpful in developing new products, services and processes. Non-customers could be those outside of your current target market, but could use your products and services if they were refined to meet the needs of the new market. The authors state it is important to understand your customers and non-customers perspective. The authors talked about making sure all departments are represented on the team. Most small businesses do not have departments. However, a small business owner may assemble a team of key employees, family and service providers. Diversity is important in the make-up of the team. Consider attributes like experience, age and gender. Conder Business Solutions has developed an innovation process called the System of Pi™ (Profitable ideas) specifically for smaller businesses. The system incorporates many “large business” concepts, but they have been refined to fit the needs of smaller businesses. Contact us today and together we can begin challenging the status quo.